No female likes to have the muffin top which pooches out of a pair of jeans. No matter what top is worn, it then must be roomy and long to cover this area. 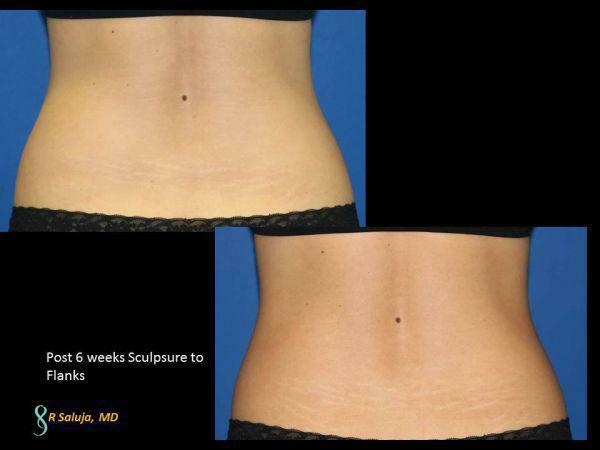 In Charlotte, North Carolina, patients opt to treat this area nonsurgically with the Sculpsure Laser. 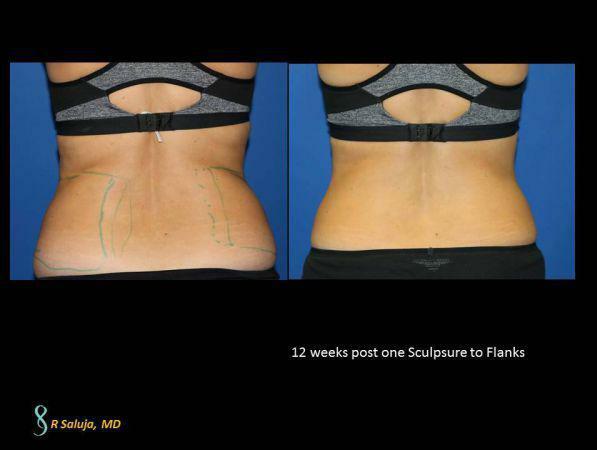 Two treatments every 6-12 weeks are recommended to achieve optimal results, however this is a patient who is 6 weeks post one treatment to the flanks and decreased subcutaneous fat is visualized. Sculpsure laser is a diode laser that targets the adipocyte (fat cell). Over a period of 3-6 months the fat cells are cleared by the body. The treatment consists of 2 laser treatments separated by 8-9 weeks. This is a patient who only had one treatment and will be doing the second treatment, 6 months post the first. While 2 treatments are recommended to achieve optimal results with Sculpsure laser, this is a lady who is 6 weeks post one treatment and beginning to show results. Menopause creates many changes in the body, from thinning, drier skin to intermitten hot flashes. With time, our metabolism also changes and areas where we did not carry fat, such as our abdomen and arms, now begin to show pinchable, subcutaneous fat. While diet and exercise are very important as a main contributer to keeping the fat at bay, there still may be areas of the body that are poorly responsive to this regimen. We tell patients that Sculpsure allows patients to wear their clothes better by diminishing up to a quarter of the pinchable fat. We recommend a full treatment which consists of 2 Sculpsure treatments. 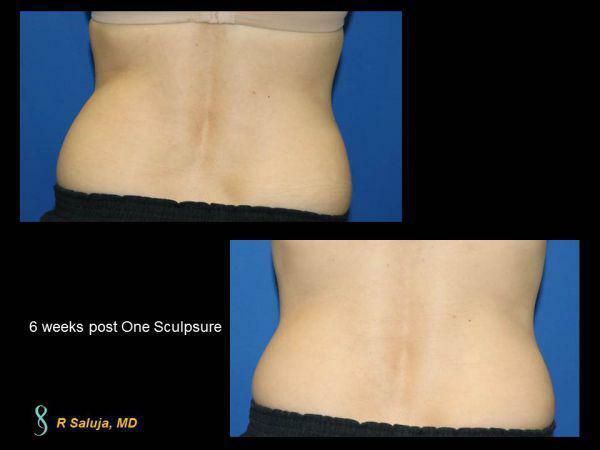 Here is a patient that had her lower abdominal fat targeted. While there is still remaining fat, the area has shrunk down by about 25%. Sometimes we just want our clothes to fit a bit better, especially in the flank area or commonly known as the "muffin top" area. When diet and exercise are not enough, Sculpsure Laser may be an option to help patients in the Charlotte, North Carolina area. The treatment is 25 minutes and results begin to be seen at 6 to 12 weeks. A second treatment may be warranted at 12 weeks and here is a patient who is 6 weeks post her second treatment to the flank area. Submental fat is fat under the chin. This may be secondary to heredity or may develop over time. Needless to say, it is bothersome to patients as it changes their profile and tends to age their look. 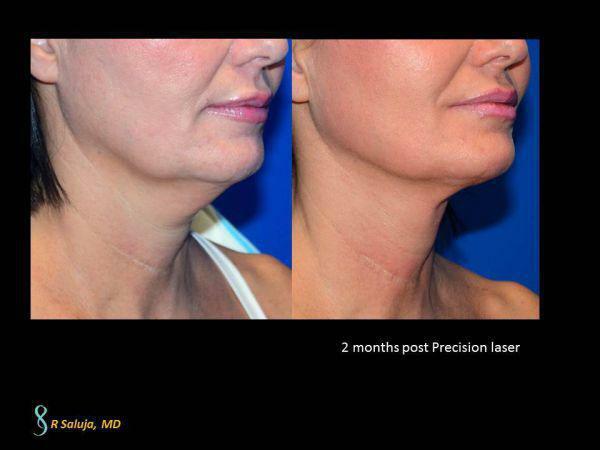 While several modalites can help with under the chin fat (Kybella, etc), one of the most significant treatments is with the Precision Laser. It targets not only fat but also results in tissue tightening by increasing the collagen and elastin in the skin. In the Lake Norman area of Charlotte, NC, this procedure may be one that is right for patients needing to address both the fat under the chin and the skin laxity. 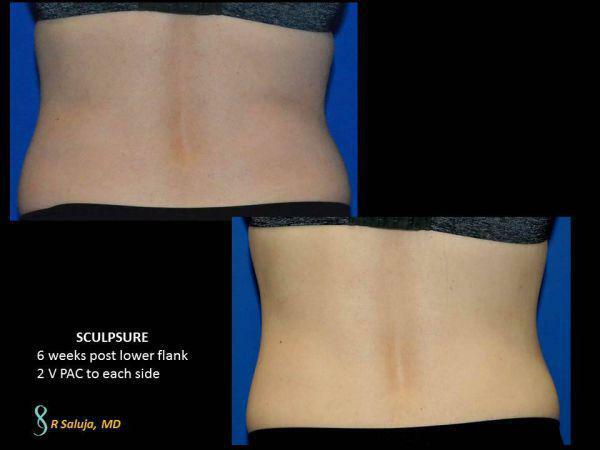 While we recommend 2 treatments with Sculpsure, this is a patient who is 12 weeks post one treatment to the subcutaneous fat around the central abdominal area (belly fat). Of course diet and exercise is the tried and true to keep the body in shape. As we get into our 30's and 40's and older, our metabolism begins to change and despite our normal excercise regiment and clean eating, there can be areas that are bothersome to us. This Charlotte, North Carolina female was bothered by the area around her flanks. 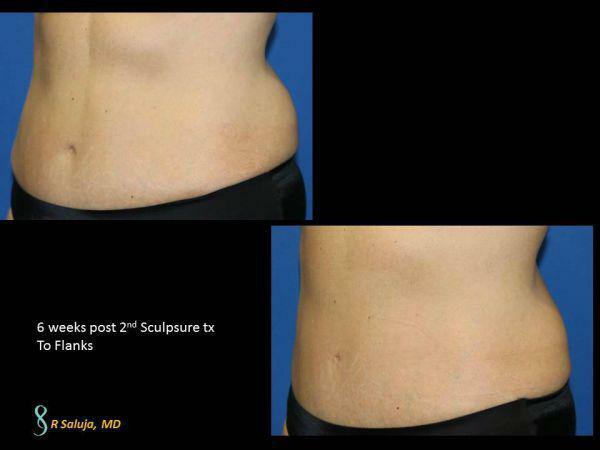 This is post one Sculpsure laser at 6 weeks post where fat reduction is seen. We show our age not only around our eyes and on our hands, but certainly on our neck. With time, the collagen and elastin is lost which results in crepey skin. We also begin to deposit fat under our chin and we lose our strong jawline. 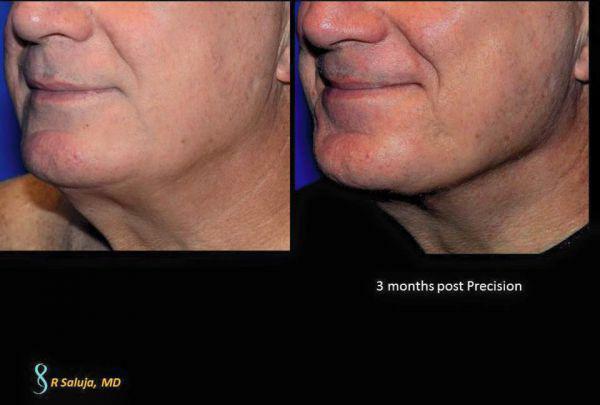 This Charlotte, North Carolina gentleman opted for the Precision Laserlift by Dr. Saluja to address these issues. A Charlotte, NC lady in her mid-60’s, was looking for treatment options for her abdominal fat. After menopause, she noted the accumulation of fat through the mid-section. While she remains active and does eat a healthy diet, this area was an area that no matter how much diet and exercise, she still could not diminish the appearance of her belly. 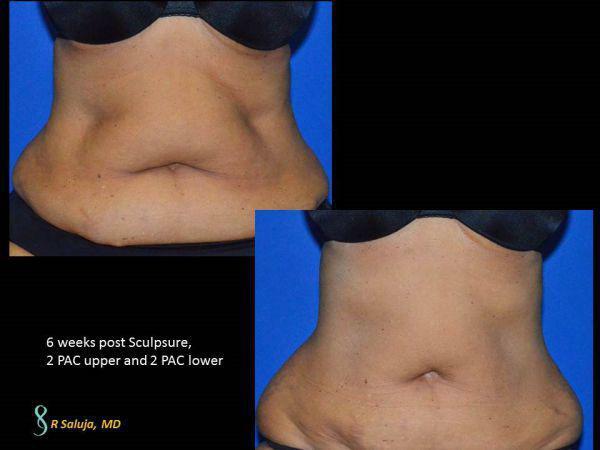 She sought treatment options that were non-surgical to diminish the belly fat. 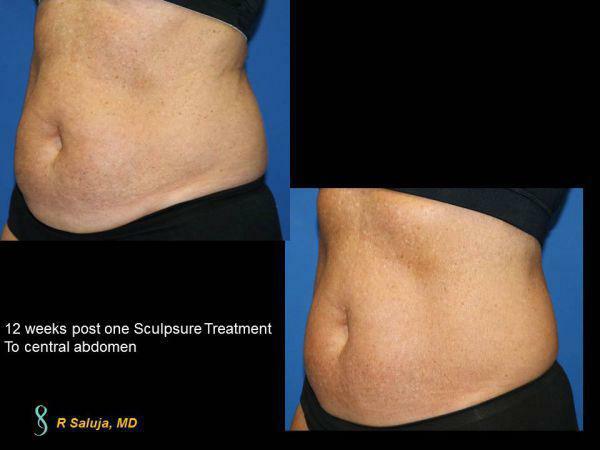 She tried SculpSure laser and the upper abdominal area and lower area were targeted. The difference in the appearance of her mid-section at 6 weeks was astonishing. 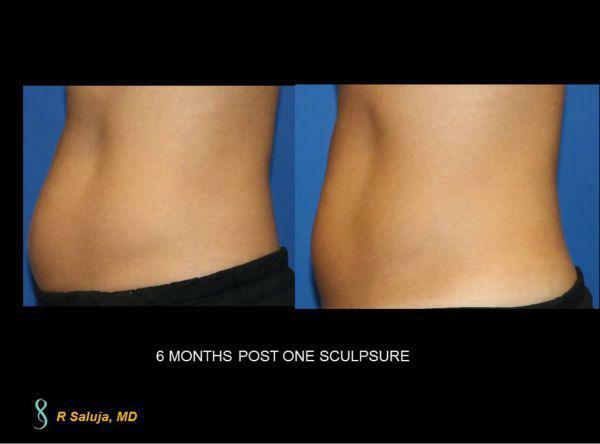 SculpSure laser begins to show the reduction of fat at 6 weeks with the full effect seen at 12 weeks. Once the fat cells are gone, those particular cells are gone! Despite proper diet and exercise, one of the most difficult areas to keep lean is the flank area. Patients in Charlotte, North Carolina who desire treatment to this area, without the need for surgery, may be a perfect candidate for Sculpsure Laser. 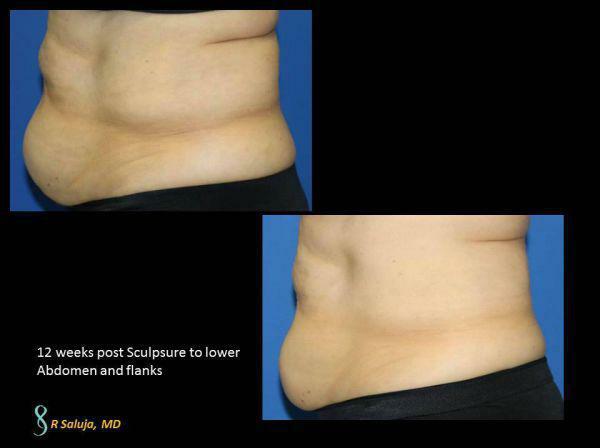 The treatment takes 25 minutes and typically 2 treatments are needed to minimze fat to the flank area. This is a patient who is 12 weeks post one treatment to the flank area.